WindLight and the wedding of Destroy Television and Walker Spaight. More information about the new viewer and lighting system is on the official Linden Lab blog and you can download it here. Some weeks ago I heard the first time about a thing called the Relay For Life and it’s Second Life part. Back then I did not know anything about it and it seemed very hard for me to find any information about the SL part online. Thus I kept asking people and now I know and I think it’s time to write it down for all the other people out there who wonder what it is. a track for 12 or 24 hours, to honor those who are surviving cancer, those who have died from it, and the efforts of all who fight it”. And last year and this year the same event is held in the virtual world of Second Life, organized by Jade Lily. In Second Life there will also be teams competing in a friendly manner to do the most fundraising. They are holding their own events (I reported about the Dominus auction) before the main RFL event in order to raise money and they are placing RFL donation kiosks all over Second Life to which you can donate. At the main event their job is it to run around a track which is layed out on 12 sims for 24 hours. People (YOU!) are supposed to come there and cheer them and to donate money in the luminaires which are placed around the whole track. 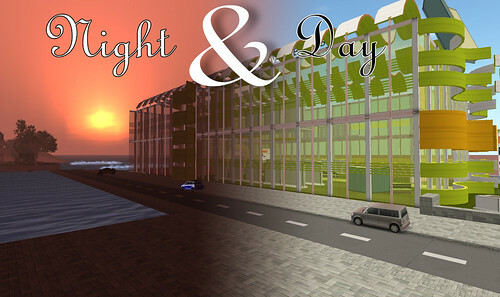 Residents from all over Second Life are busy right now to fill the 12 sims with buildings representing the whole world. Moreover there will be concerts and other events (more details will be posted later) during that day so make sure you attend and have some fun! And here’s that video I created as my contribution to the event:	Watch the Video. I just submitted it to the alt-zoom take5 festival and any prize money which might come out of it will go to the Relay For Life. The video contains music by Ash Verjee, provided by the Podshow Podsafe Music Network. Update July, 22: There is another video now available announcing the start and containing more footage of the finished builds. For the first episode he actually asked me if I want to be an actor in it and I said YES! 🙂 So I ended up playing myself and interviewing two robots about their plans and background. Be aware though that although my intro is coming there it’s actually mostly made by Aren Mandala (including the script). I just discovered a nice new video podcast ready for your iPod: Secrets of Second Life by Franklin McMahon. It seems to be aimed for the new resident exploring the world and wondering how it works. So this podcast e.g gives tips on how to find your friends or how to adjust your preferences. And we need more of that, so all you out there, press RECORD and start your own video podcast! Some of you might have noticed and some of you might even have attended! There’s a new show out there called “Late Night with Eggy Lippmann”. It’s a revival of the old show by Darwin Appleby. It happens at the Afton Lodge in the Afton sim and will feature different guests in each show. Think sort of Conan O’Brien. Eggy asked me to film the show and so I did. And right now the third part of the first episode will be put online. Find these shows at the blog to the show! So he approached me to help him with it. Of course not everything did work out for the first show so e.g. it was longer than 30 minutes and you cannot really split it into a separate part for each guest. Still we tried to do the 3 parts things although the second one is longer now. But a bit more about the technical details maybe. I’ve setup a little camera system with predefined camera angles using the new camera functions in LSL. I basically placed objects where I wanted the camera and focus to be and recorded them with a hotkey. So I have angles now for close-ups for all guests and Eggy and a total of all the guests. Later I will also add an angle for the audience. I created gestures for switching and put them onto hotkeys so I can quickly switch between them when recording. I will improve on that later to store these settings on a notecard instead of script memory where it’s easily lost. Some dolly shots for the audience might also be cool, I just wonder how complicated it might be to get these working as changing the cam position or focus via the camera function does not trigger the position or focus lag but switches directly. For the normal cuts that’s ok but it means that dolly shots are not possible with it. As people were intended to do that via chat and not voice we needed to have the chat visible. So this means that we cannot disable the UI for recording as chat would be invisible, too. IMs were also a problem as you cannot be in busy mode for that as well. So I got an alt and did it with him. Moreover I selected the big chat font, disabled Music and Video to get rid of the boxes, switched off the toolbar and chat line and that’s it basically. In post production I still was cutting the Menu line away though but that’s a preset now. For making video nicer I switched to Midnight and put some lights into the scene close to the guests and Eggy to make the video look better. That’s always a good idea if you don’t want to spend much time in post production to make things look better. Of course a late night show should have a fitting intro. So I went to Midnight City and did a few photos there to use that. My original plan was to do some more video shooting at places with certain architecture in SL but I didn’t had time for that. So I will improve later on it. I will make the intro available to other people who want to record one show later. As we mainly have chat and no big action except some shots we can go with a very low framerate and indeed I used 10 fps for that. This also increases processing speed quite a lot in post production. For the rest I used the usual settings as can be read in freevlog.org. Some issues I’ve pointed out above but there’s more. Like it’s still not very interesting sometimes to watch people type while waiting for the actual sentence. But in order to keep typing times small it would mean to do cutting in post production. This again might be a time consuming process in order to find the right spots. So I wonder if we can come up with some sort of marking mechanism during recording to point out where to cut. So some research might be necessary here. Then I need more people to film it. So if you are willing to help please contact me. There’s not much to know, you will get the camera system and instructions on how to record and compress it later. I will also do the first ones together so I can notice where problems might arise in the process. So that’s my little Late Night report. Attached are some photos from the first event. Look out for the next event which might even happen during the birthday party celebrations.